All tributes to our founder, Pujya Anuben Thakkar for her devotion, hard work and vision that has contributed in promoting the highest level of ethical and affordable cancer care at KCHRC that is renowned regionally and nationally as one of the most comprehensive cancer hospitals. To ensure that our patients receive the highest quality, all our efforts and investments are directed towards providing world class services. 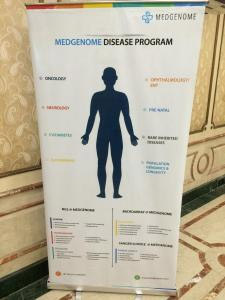 Thus, in collaboration with the MegGenome Labs Pvt Ltd, we are setting up the Molecular Genetics Laboratory to set new standard and elevating Indian cancer research to a new dimension. Genetics are already a viable part in changing the world - holding out the potential for new drugs and therapies, new means of preventing illnesses and new ways of treating them accordingly. The inaugural function of the Molecular Genetics Lab at Kailash Cancer Hospital & Research Centre, Goraj was held on 17th January, 2016 in the presence of eminent national faculties and scientists from different medical fields. The inauguration function was followed by short CME highlighting the role of molecular genetics in improving cancer care. The molecular genetic lab will cater two services: diagnostics and research. The diagnostic arm will provide a molecular profile to give a better understanding on how chemotherapy will affect the patient. We will be able to better predict the likelihood of an individual responding to a particular course of drug treatment. The research arm will help to understand the genetic profile of various tumours and other diseases. In time we should be able to assess the risk an individual has of developing diseases - not just for single gene disorders like cystic fibrosis but for our country's biggest killers - cancer and coronary heart disease - as well as those like diabetes. Eventually we will be able to develop new therapies which hold out the prospect not just of treating diseases but of preventing them.